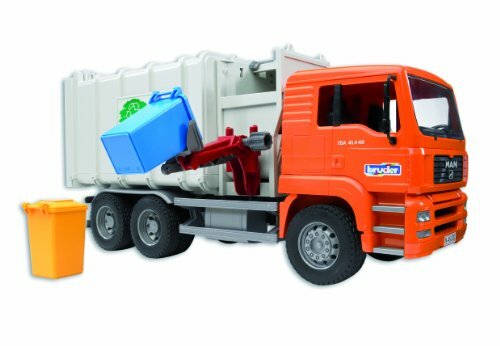 The MAN Side loading Garbage Truck by Bruder #2761 is a must for any child ages 3 and up. This new one man operate system can be seen functioning daily on any street in cities around the United States. Our MAN Side loading Garbage Truck is fully funcional with a grapple to unload the bins. The tailgate opens and latches and the collection body tips to unload the garbage. Additional garbage can sets can be purchased by order #2606.